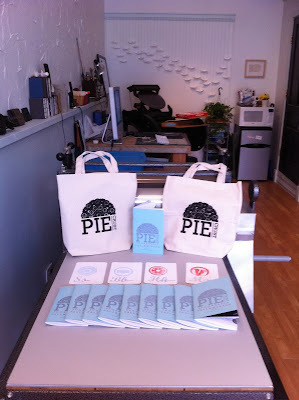 I found out about Piecrust magazine from its Kickstarter-- before it ever actually existed in print. I was intrigued by the name (of course), the launch of an art and literary magazine (my friends and I used to have one, The Dovetail Collective, r.i.p. ), and the letter pressed, handmade aesthetic. I contributed to the Kickstarter launch, and asked Megan Collins and Lauren Cardenas, Piecrust's masterminds, if they were interested in doing a little interview, and they graciously agreed. Megan: I am from Paragould, AR, currently I live in St. Louis, attending grad school at Washington University. Lauren: I am from Austin, TX, though I recently came to St. Louis for grad school last year. We both came to Washington University (Wash U) to get our Masters in Fine Art and we are both printmakers who like to bake. Tell me about your project, Piecrust Magazine. How did you get the idea? How did you get into letter pressing? What is your vision? Lauren: Earlier last spring I approached Megan about starting a magazine that would be art related, focusing on works on paper. We didn't really talk about the idea for awhile, until after the Southern Graphics Council that was hosted at Wash U. That is kind of how it started. We were also really bummed to find out all of our favorite magazines lost all of their funding. That kind of motivated us to make a magazine that was ad free, inexpensive, simple and art related. Megan: We both learned letterpress in a book class that was offered at Wash U. We kind of fell in love with the medium and process of letterpress. The class was just another activity that we were involved in, we also were paired with the same faculty advisor. The technique began to spill over into our own studio practice, which led to this idea of creating a zine or magazine. Our vision was to have a 30 page magazine, with works on paper, including various forms of art and writing. We wanted to have letterpress cover and hand bound saddle stitched, but the magazine doubled in size and it didn't seem feasible to hand bind the magazine. Why pie? 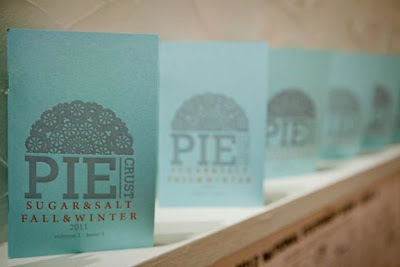 (or pie crust)? We love idea of the pie crust as a foundation, much as paper is for art and writing. It's a starting point, a foundation. And who doesn't love pie, seriously, it's simple. How did you learn to bake/who taught you? Lauren: My mother taught me how to cook and read a recipe. I taught myself how to bake, my mom was not a huge baker when I was young. Megan: My friend Mickie and I kind of taught each other, we had grandmothers that were into baking and we grew up baking with them, but not really learning from them. Megan: I have a three way tie, lemon meringue, rhubarb, and peach. Lauren: I have tie between pumpkin and blackberry. Special thanks to Megan and Lauren for taking the time to talk with me, sharing their thoughts and pictures, and for working hard to create and promote small, handmade art in the name of pie. Make sure to check out Piecrust's online home here, purchase a copy of the beautiful magazine, and submit your photos, art, words and more to the next issue (deadline for submissions is December 1 at midnight)! Congratulations on your success with the magazine. You both are intuitive and visionaries in the art world. I wish both of you young ladies continued success. You are our tomorrow and our future go and follow your dreams and don't be discourage or don't look back.